Home » The Word » Christ’s true Hebrew name: Is it essential for salvation? Jesus refers to the extraordinary man born immaculately and ordained by God to be the first Christ (or Messiah) to deliver God’s Truth (Word) to humanity. Therefore, while Jesus’ life and messages/teachings are divine and relevant to man’s salvation, as these are wholly from the Father, Jesus, being merely a Spirit-filled man who fully expressed the will, wisdom, word and authority of God, should never be the center of devotion. Christ is not an exclusive reference to Jesus, as it is the condition wherein any ordained or chosen man (even to the present time) is filled with God’s Spirit (Word) for the purpose of delivering God’s “Saving Truth” to humanity. Christ is the omnipotence and omnipresence of the ONENESS in God. If one is Christ or possesses the Christ-nature, this is the same as seawater in a glass in relation to the vast Ocean.The seawater in the glass cannot be the Ocean- in the same manner that as Christ, one is not ‘The Christ’ or ‘God the Father’. No person in his physical-nature and singular form can be both the seawater in the glass and the Ocean. But, the seawater in the glass smells and tastes the same as any portion of the entire Ocean, and that there is just but ONE origin, which is the One Ocean. The glass or vessel represents the flesh- the human-nature coexisting with or containing the Christ-nature (God-expressed)- in perfect unity. To simplify the above submission, it may be re-stated as follows: “Jesus, as a man, was the first messiah. He could be followed by another ordained or chosen man, who is filled with God’s Spirit (Word) for the purpose of delivering God’s “Saving Truth” to humanity’. In short, impliedly, the true Hebrew name of Christ or the settlement of the issue on falsity of the name Jesus is no longer material for salvation. 5Thomas said to him, “Lord, we don’t know where you are going, so how can we know the way?”6 Jesus answered, “I am the way and the truth and the life. No one comes to the Father except through me.7 If you really know me, you will know my Father as well. From now on, you do know him and have seen him.” (John 14:5-7, New International Version). Preliminarily, let it be understood that the name Jesus, as cited in John 14:5-6, is a big lie, as it never existed in Bethlehem, when Christ was born until he was crucified. It was merely transliterated from Greek name Ἰησοῦς (Iēsous) into the final present form Jesus by King James 500 years ago, after the Letter ‘J’ in the English alphabet finally came into existence. By implication therefore, there could be no other messiah that will come after Christ, as he is the only way to the Father, being implied by the phrase “no one comes into the Father except through me’. Thus, the above contrary opinion is grossly erroneous. It is because it is admitting the proposition that there could be another Christ to act as another way aside from fictitiously named Jesus, who is the alleged first Christ. 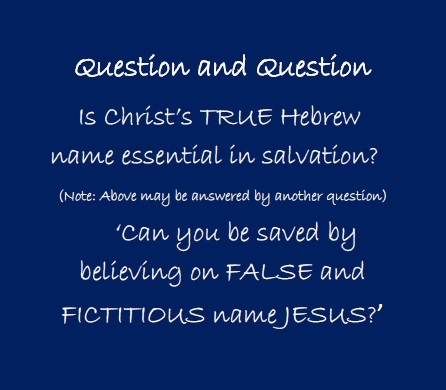 Now going back to the issue, a question may be raised: ‘Is the true Hebrew name of Christ really essential in salvation?’ Before answering it, you must also ask yourself whether the false and fictitious name Jesus is likewise essential in salvation? Also, if you are believing on a false and fictitious name, then you will surely loss salvation. Because, you will be believing on a false christ resulting to believing on a false heavenly father. Further, if you use the fictitious name Jesus, by faith, as the name of Christ in the bible, words therein would be adversely affected resulting to conversion of the truth to full-blown lie. Finally, therefore, the true Hebrew name of Christ is essential in salvation to lead Christ’s believers to the true way, true truth and true life. Also, it will re-establish the truth that an entity with a Hebrew name, which is being pronounced ‘Yahushua’, is, in fact, the way, the truth and the life, which truth was destroyed by Christians through the bible by using the false and fictitious name Jesus. By aaphil in The Word on February 16, 2015 .